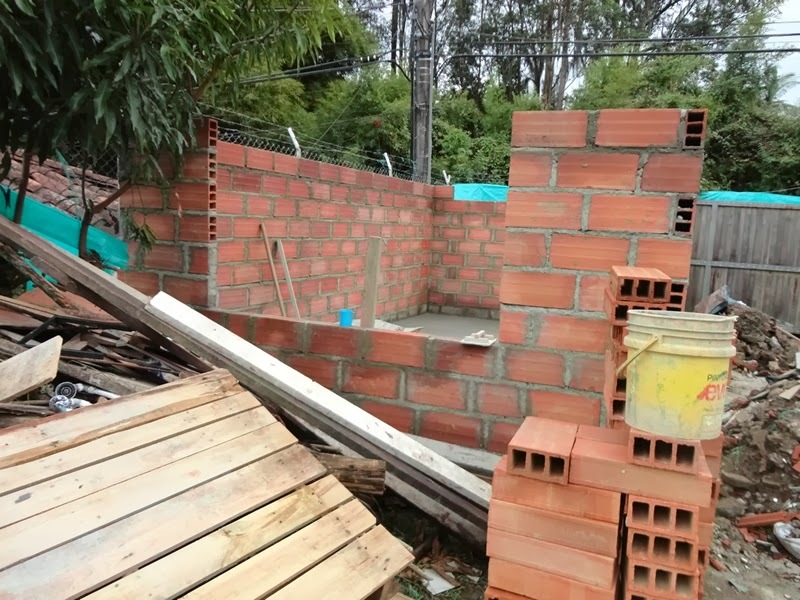 An Englishman in Colombia: Work progressing! Yesterday was a bit of a shock to the system, I did a full days work, well, eight hours! I left home at 7.30pm calling to buy some fittings, my breakfast and lunch. 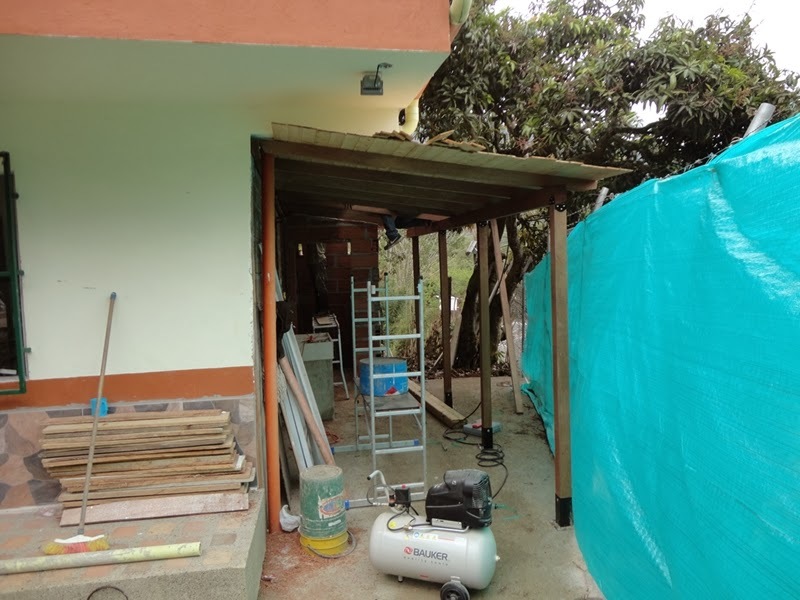 My intention was to fit out the walk in wardrobe (Vestier), but John asked me to get on with starting the 'zona de ropa' or covered drying area alongside the house, because he was concerned that the wood would be effected by the start of our rainy season. So woodwork it was, we installed the posts and beam, using my new metal fittings, which seemed to impress John and Ramillo, and then I set to cutting and shaving the purlins, these are now all ready with the exception of the bird-mouth joints, to install, hopefully today, once we get the other support beam attached to the side of the house. 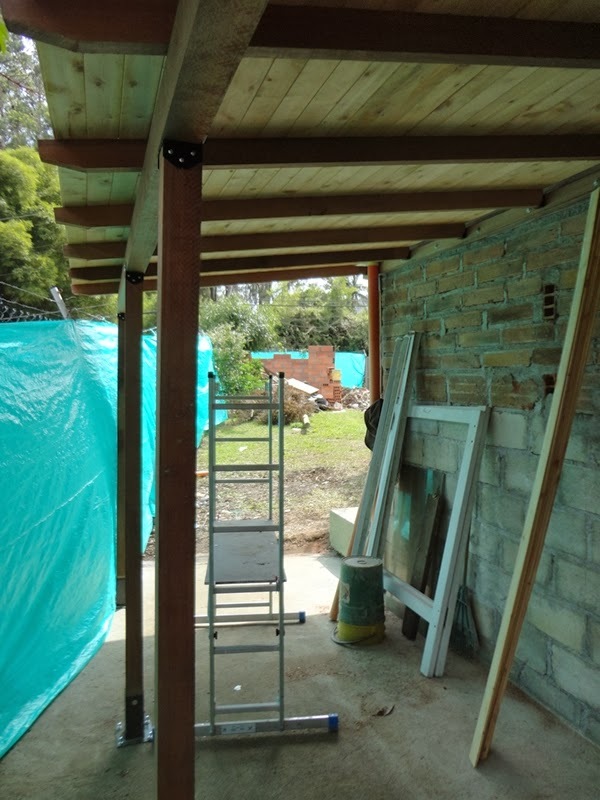 Whilst I was doing that, the others were getting on with building the workshop, which is coming on nicely, they had one problem to overcome, and that was the removal of a Aguacate tree from inside the workshop, it was a fair size and full of sap`, which made it all the harder. During the afternoon, they back filled the land drain, on the neighbours land, and it was nice to see that Juan (the Marijuana Kid) was being pleasant, gave the lads drinks of juice, and bags of fruit to take with them, however I think whilst the boundary has been open at the back, he has been snooping, and looked through the window into my temporary workshop, because he seemed to know what tools I have! I took photos of the work in progress, but I have not had time to download them yet, so will add them later. Later, a lad from the Kitchen company came out with the man who made the stainless steel counter top, the latter tried to make out it was the walls at fault, which angered John, and told him so, after much debate, he is coming hopefully on Sunday to remedy the situation, and if he doesn't, then the Kitchen Company will have to think of another solution. I am just waiting for Marcela, she needs the car today, she is taking me to work, and will collect me later this afternoon, so I will have to do a full day whether I like it or not! I have just got back from work, it has been a long day! This morning I resumed work on the shelter at the side of the house, whilst John and Ramillo were putting in on the Workshop floor, no concrete mixers here, all done by hand. After John and Ramillo had run out of materials, they came over to give me a hand, but ended up taking over, which miffed me a bit, but since some of the work, meant climbing on top of the purlins, I wasn't going to argue. John had great fun with my Air Nailgun, there is no way the wood is coming off, until it rots! 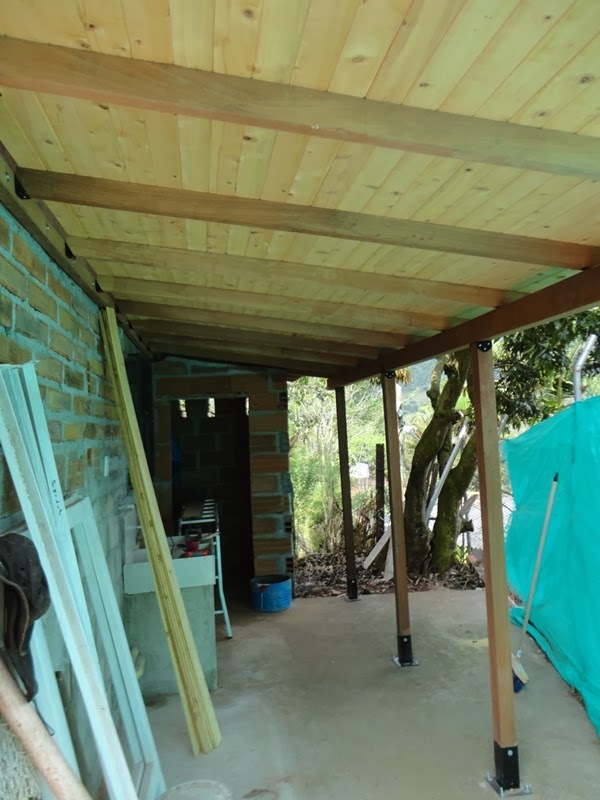 Once the work was complete, both John and Ramillo admitted that they were very impressed with the metal fabricated joints and post bases, it certainly made work quicker and easier. The wood is wet, so felting and tiling will have to wait a few days, and hope we get a spell without rain, which it has been doing nearly every night. 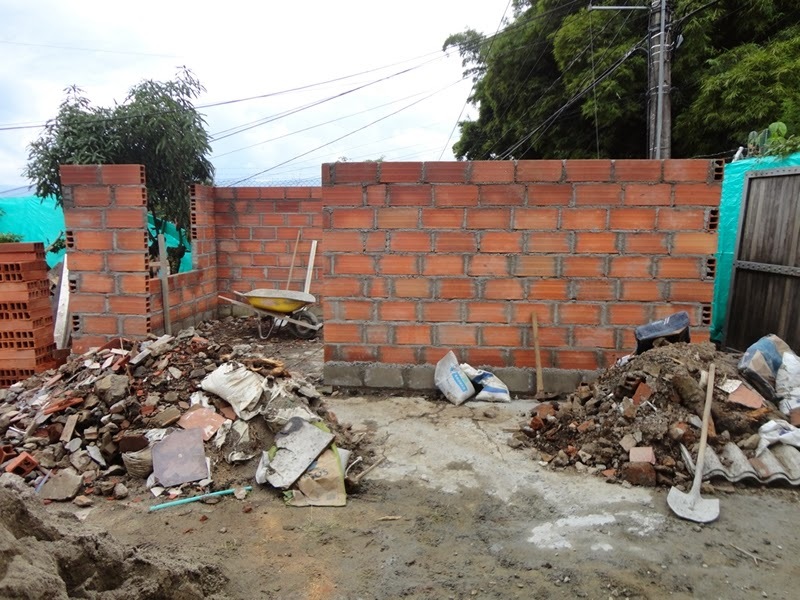 John and Ramillo then went back to mixing concrete, as more materials had arrived. Marcela came to pick me up just after 4pm, and on the way home we stopped off at the kitchen shop, Marcela was given the number for the stainless steel counter top fitter, she contacted him, and he said the kitchen was going to have to be removed, and he was taking the top out. Marcela then recontacted the kitchen shop, who said they would be at the house between 7-8am in the morning, as a result no one was happy. Later Marcela received a call from the Top fitter, who has changed his mind, and will refit the top in situ on Sunday morning, hopefully he will turn up, otherwise I think Marcela might well have a few legs broken!